A truck bed and a good tool box are essential in many different jobs, critical for organizing your gear, tools and machinery in the back of your truck or SUV. There's nothing good about having your tools scattered, as they can get damaged, scratched or hamper the efficiency of any work team. With custom truck drawers from the professionals at D&R, you can keep your gear and tools securely stored and organized. There are several types of truck drawers that we can customize and install to suit your company’s specific requirements. Your choice of truck drawers depends on the tools you rely on for your work and how big your truck bed or trunk is: we can optimize the storage space available as well as determine the ideal box mounting style. There are several types of truck drawers that can employ different materials, can have customized applied finishes, and an optimized installation and configuration of the lid. These specifications can be customized to employ shelves, partitions or trays inside. One of the most practical types of system is the dual truck drawer. It is intermediate in size, between the single and multiple drawer systems. It is ideal for a very wide range of professions which require on-field work and professional tools. 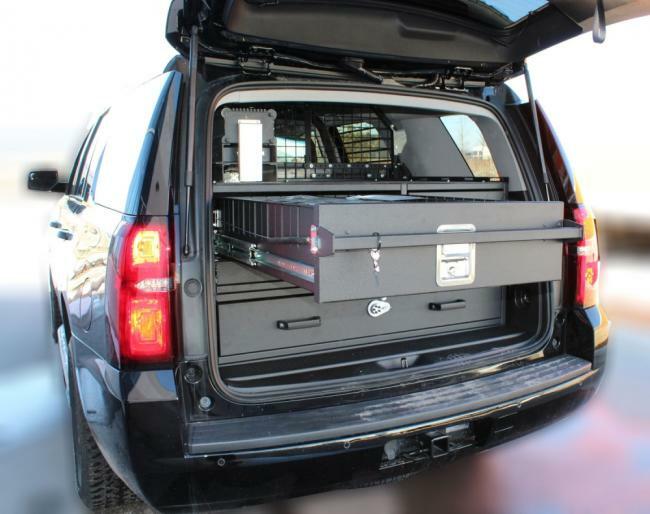 Storage System 2 Drawer Plus Whiteboard Drawer -- This type of dual drawer has a special partition for the Chevy Tahoe. It is made from lightweight aluminum material and is strengthened by hard black epoxy paint. Custom Storage Dual Drawer 35 Inch Depth - This is one of the best truck drawer systems because it is custom designed for 2015 to 2018 Chevy Tahoe. It is also made from lightweight aluminum and fortified by hard black epoxy paint. Storage System Dual Drawer with Partition - This is ideal for the 2018 Ford Interceptor. The dual drawer system has a cargo partition with separate sub-frames. It is also made up of the same lightweight aluminum metal and coated with hard black epoxy paint. When it comes to choosing an appropriate drawer system for your service truck, we can help determine the best solution. We offer in-depth technical experience and quality parts – contact us today to learn more about truck drawers and customized installations.